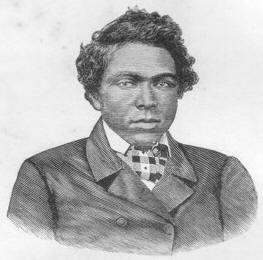 Read about a real life "DJango" in David S. Cecelski's new book "The Fire of Freedom: Abraham Galloway and the Slaves' Civil War"
I have to admit, I never heard of Galloway prior to posting the review of the book about his life. How many more figures from American history would be just as, or even more, inspiring? So much energy has gone into a debates over fictional characters like Django, fueled by a tweet, and regurgitated by our so called "news" sources that actual people like Galloway go virtually unknown... Happy Black History Month. Cecelski, huh? Once again other nationalities are telling "our" stories. Whatever. Better someone than noone. This would have made a better movie then Django. It shows slavery as the horrific system it was. And there was nothing,nothing funny about it. Better someone than noone -- absolutely! Though unfortunate. Even in this case, this book will die on the vine, 'cause we are much more concerned with talking about Django. Do an internet search of this book and see how many Black sites you find.